In large bowl, beat 1 cup softened butter and the granulated sugar with electric mixer on medium speed 2 minutes, scraping bowl occasionally, until fluffy. Beat in eggs, one at a time, just until smooth. Beat in 2 teaspoons vanilla. On low speed, beat in one-third of the flour mixture, then half of the milk, beating well after each addition, just until smooth. Repeat with flour mixture and milk, ending with flour mixture, scraping side of bowl occasionally. Spread batter evenly in pan. 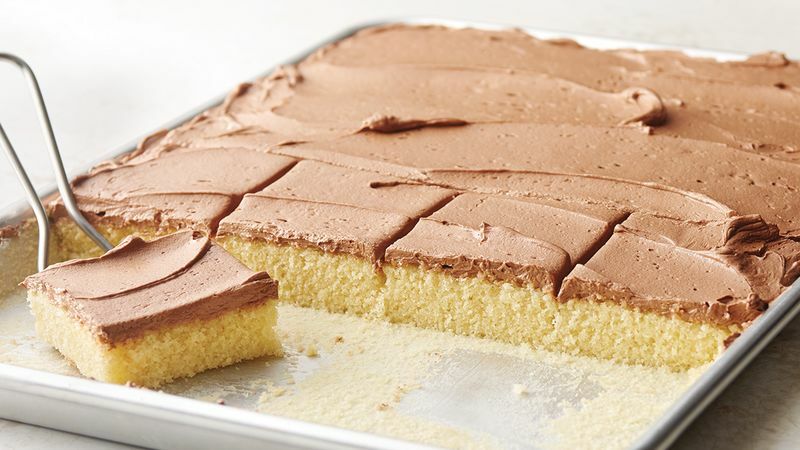 Tap cake pan on counter 2 or 3 times to eliminate air bubbles from batter. In medium bowl, beat Frosting ingredients with electric mixer on medium speed until smooth and creamy. Spread on top of cake. To serve, cut into 6 rows by 4 rows. Store loosely covered at room temperature. Measure ingredients accurately, and add them in the order listed in the recipe to ensure success. There’s something to be said for boxed yellow cake mix, but there’s also something so satisfying about making a cake from scratch. Bonus points if the frosting is also homemade! This chocolate buttercream frosting is rich in flavor and in texture, thanks to the high fat content of butter. Buttercream frosting is sturdier than whipped frosting or icing so it works well for cakes especially. It can also sit at room temperature and doesn’t have to be refrigerated. For ultimate success, make sure you use unsalted butter and soften it before adding it in with the other ingredients. You can certainly take the frosting part of this recipe and use it on any yellow cake, even boxed cake! Now that you have this foolproof frosting, master the technique of frosting a cake.